141. How to Extend a VO which is having View Link? VO extension will take of viewlink by itself So we can extend this VO as usual VO Extension. 142.What is the Purpose of Serializable in OAF? 143. How to Synchronize an Entity Object (EO) with Data Base? 144. What are the methods in controller? 145. How do you catch the button event on ProcessFormRequest Method? if (pageContext.getParameter(.EVENT_PARAM). equals(“update”)) Here update is the event. 146. How to create a Dynamic VO? 147. When is processFormRequest method called? ProcessFormRequest(PFR)t method is called when we perform some action on the screen like click of submit button or click on Go or any action perform on the page the result is displayed is called PFR. 148. Which package should include EO and AO? 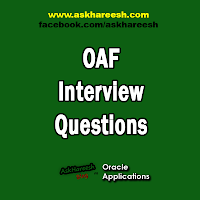 149.What is Activation and Passivation in OAF? 150. What is Validation View Object(VVO), Validation Application Module , Root Application Module , View Link , Entity Expert , Association Object , Attribute Set? Validation View Object – A view object created exclusively for the purpose of performing light-weight SQL validation on behalf of entity objects or their experts. Validation Application Module – An application module created exclusively for the purpose of grouping and providing transaction context to related validation view objects. Typically, a standalone entity object or the top-level entity object in a composition would have an associated validation application module. Root Application Module – Each pageLayout region in an OA Framework application is associated with a “root” application module which groups related services and establishes the transaction context. Entity Expert – A special singleton class registered with an entity object (EO) that performs operations on behalf of the EO. Association Object – BC4J association objects implement the relationships between entity objects. For example, a purchase order header can reference a supplier, or it can own its order lines. Attribute Set – Bundles of region or item properties that can be reused either as is or with modifications. For example, all buttons sharing the same attribute set would have the same label and Alt text.